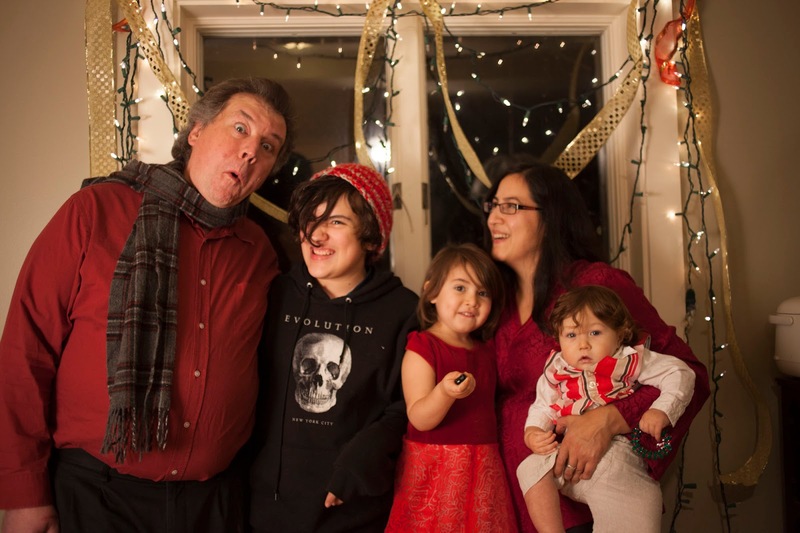 Happy Holidays 2015 from Unlikelynest! Hope you all are having a great time with family and friends! I had the sudden urge from nowhere to make an advent calendar this year. 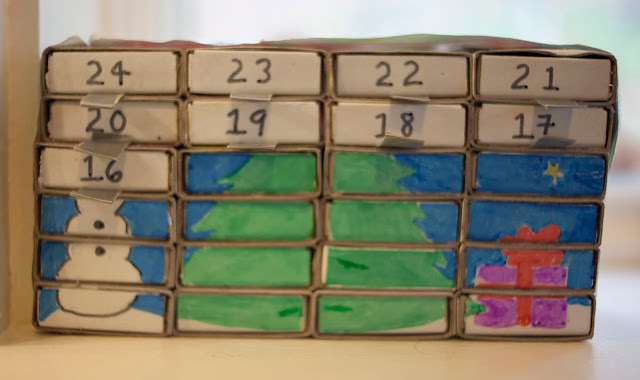 My family never made a big deal about advent, so my experience with advent calendars came from my favorite aunt, who sent me a paper advent calendar every year. They were fantastic, fabulous constructions with little windows and tiny prizes and candies. To this day I have no idea where she got them (If you're reading this, this is me asking!). So I guess I didn't know what to expect when I popped the question into google. 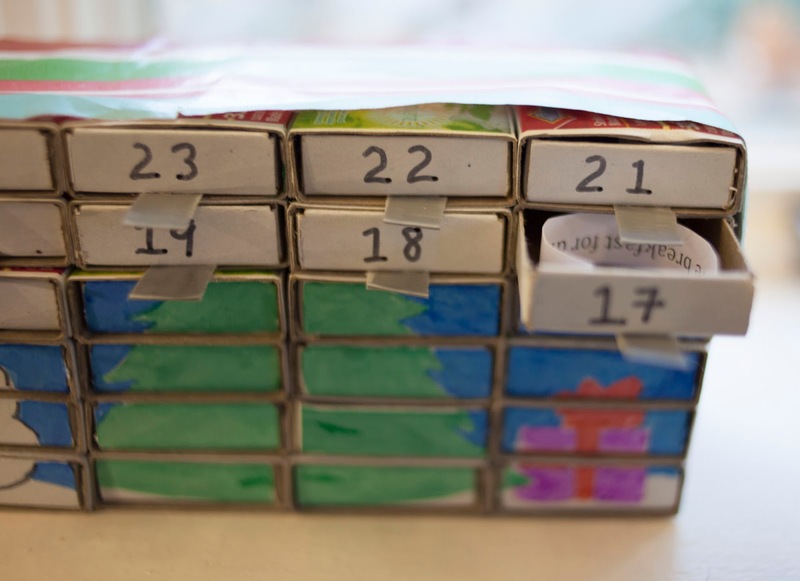 It turns out there are tons of creative ideas out there on how to celebrate advent. 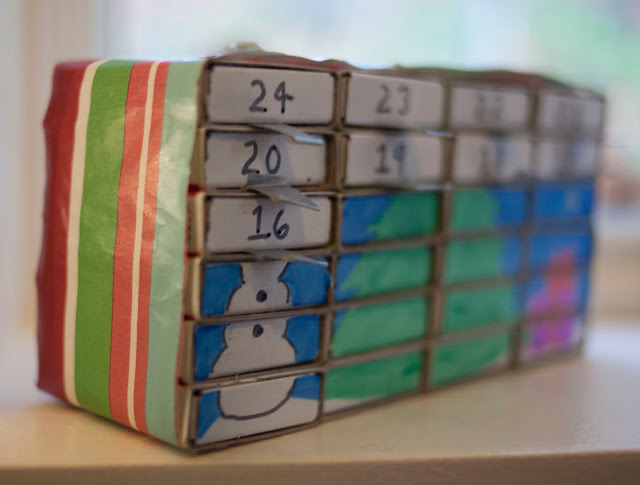 We don't have a lot of space, and I wanted something easy that wouldn't cost a lot, so I ended up making a version of Martha Stewart's Matchbox Advent Calendar. I bought 3 packs of matchboxes (it turns out my local grocery store still sells them!) and dug up a bottle of white glue. This isn't the most lovely rendition possible of this idea, but I needed to get it done quickly- I had about 10 minutes of peace and if I didn't get it done then, it wasn't going to happen. The drawing was done with my daughters washable markers and the draw handles are duct tape. The sides and back are wrapped with wrapping paper. Then the question was... what to put inside the little drawers? The obvious suggestions of stickers or candy or little dollar store items didn't really appeal to me. 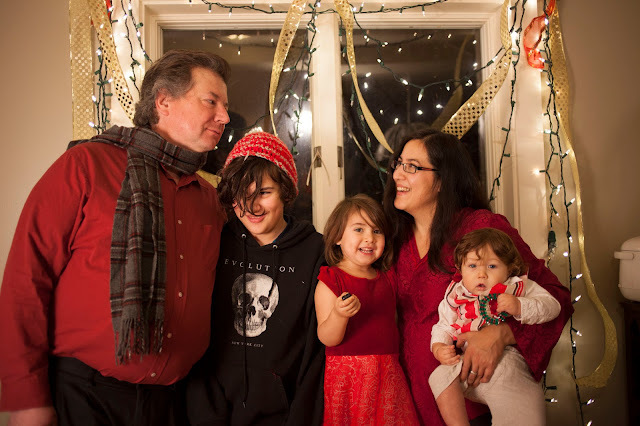 I don't really want to encourage commercialism in celebrating advent-- I wanted the calendar to really be about being together and doing things together to get ready for Christmas. 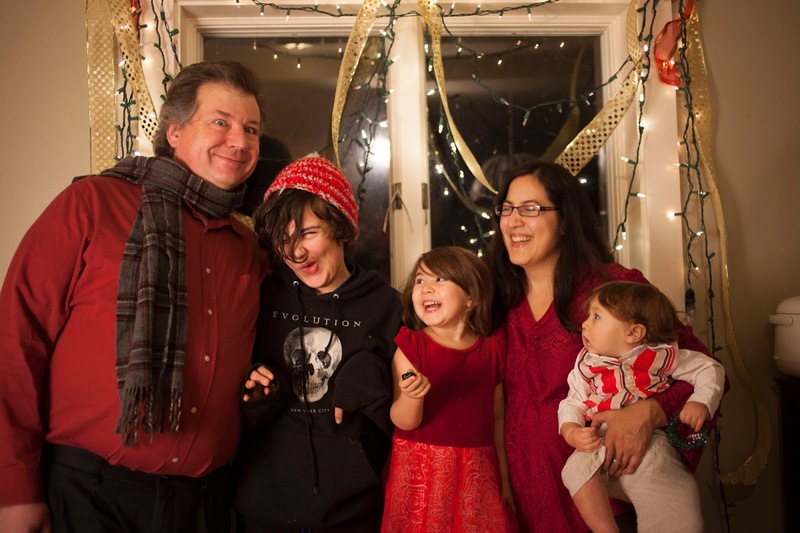 So far it has been wonderful! Little Bug looks forward to it every day, and is excited to do the suggested activity. In fact, we are having a hard time explaining why she can only open one drawer each day. 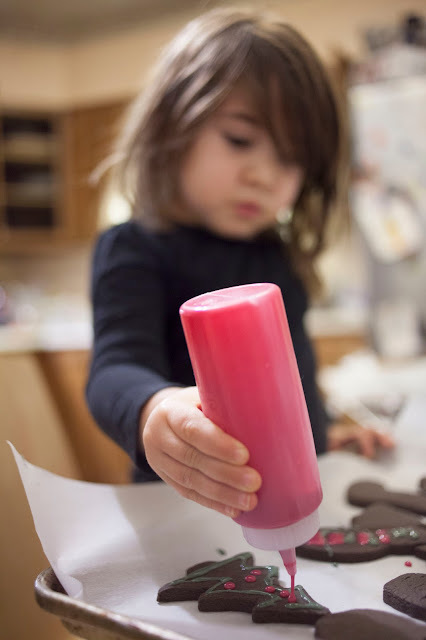 On my part, things are timed to happen on days that it seems likely we'll be excited about doing what is in the calendar--the days I know I'll be home late have simple treats on them, and the big projects are on weekend days. While it is extra work for me, it is good to have the prompt to encourage us to do something fun. For example, I doubt I would have come home and just wanted to "built a fort and eat dinner in it," but it was super fun, and we ended up playing games, reading, and going to sleep in it too! The "special presents" are little things that I have made for her. I'll post about them in another post. Once, a friend of mine invited me to a cookie exchange. What a lovely idea... everyone makes their favorite recipes, and by the end of the afternoon, everyone goes home with a variety of different types of cookies. I made the mistake of asking what was in people's cookies. Alas, I didn't get invited back, which is probably for the best! 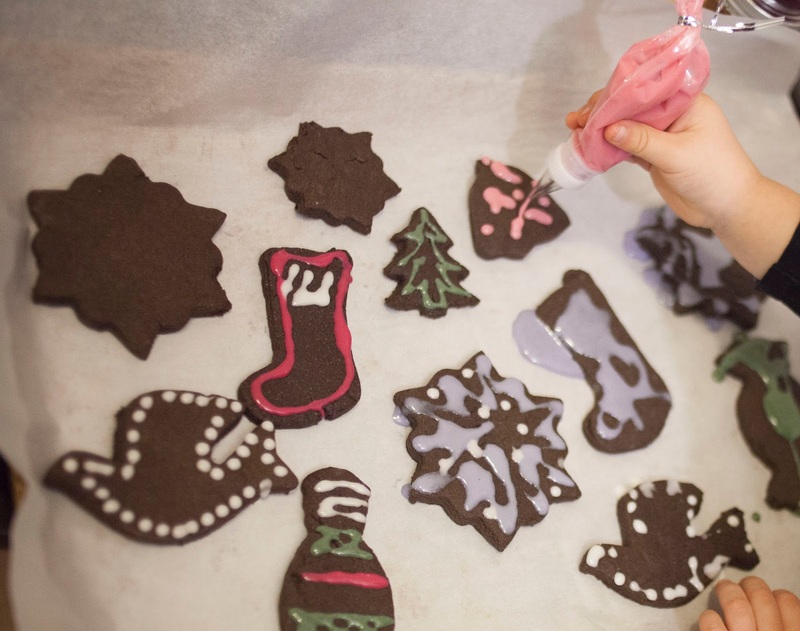 Among the worst offenders was the canned frosting that people were smearing on their cookies. Kids were gleefully licking it off their fingers. That makes me cringe, I can't even watch! I can only assume that people are ignorant about what is in that stuff. Using natural, minimally processed ingredients in the foods I cook is important to me. I never use hydrogenated oils, and I try to use whole grains and real flavorings. My family doesn't have allergies, so I use things like flour, milk and eggs. I compromise a little bit when baking, which I don't do very often-- I usually use King Arthur's unbleached white flour (sometimes white wheat, or a combo) and white sugar. 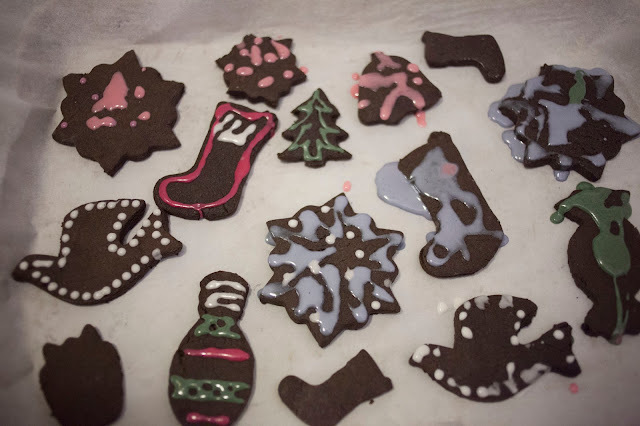 For anyone out there reading, it is really easy to make your own cookie icing. My favorite is royal icing, which I make with powdered egg whites for safety reasons (our local Michaels carries powdered meringue) Actually, it would be even better to make it from real pasteurized eggs... I belatedly read the label on the powdered eggs, and perhaps unsurprisingly, there are preservatives and "artificial flavoring" in them. In any case, I use this recipe from Martha Stewart. I'll work on getting real pasteurized eggs for a future rendition. 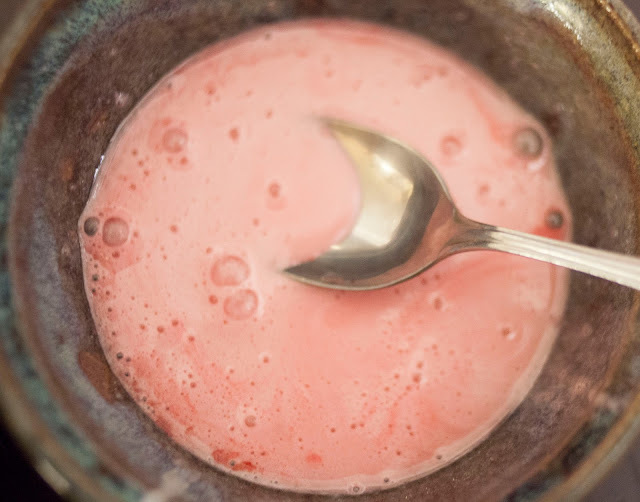 I still think this recipe is miles better than canned frosting made with hydrogenated oil and filled with preservatives, artificial color and artificial flavor. 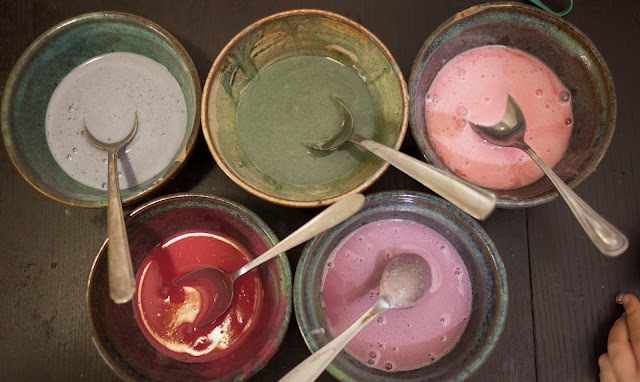 Note... if you are making this icing for natural dyes, it might be useful to reduce the amount of liquid. 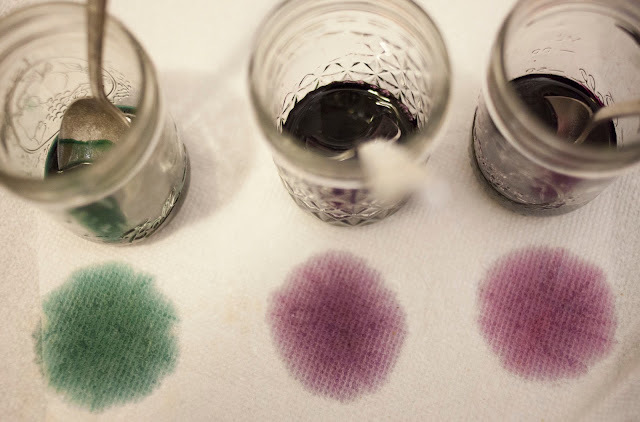 The reason for this is that even though you want to make the dye as concentrated as possible, you might need to add more, and therefore more liquid, than you would normally add with a commercial dye. I didn't do this, and some of our icings were a bit runnier than I would have preferred. Next time! This year, it occurred to me that perhaps it was time to wean myself off of artificial food dyes. I'm a little more ambivalent on these... it seems to me like you generally use so little that it that how could it be harmful. 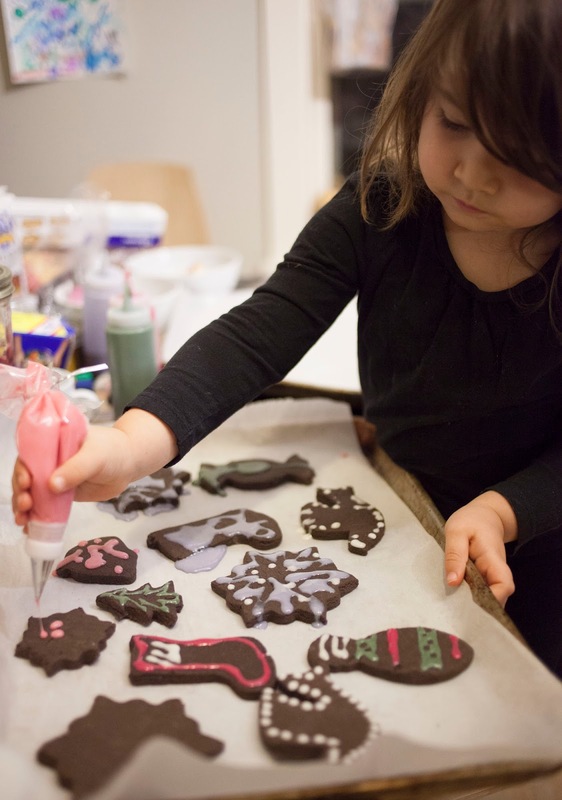 But the thought of my daughter licking her fingers as she gleefully iced cookies spurred me on. Also, it was super easy and fun to dye eggs with natural dyes, so how hard could it be to do the same with cookie icing? Not that hard, it turns out! Top, Left to Right: Red Cabbage with Baking Soda, Spirulina with Tumeric, Beet Juice. Bottom Row: Cranberries, Red Cabbage with Vitamin C.
The most successful red was obtained from cranberries! I used about 1 cup of berries and boiled them for about 15-20 minutes. I don't know if the next step was necessary (I might have been just able to use the juice from boiling the berries), but I pureed the fruit in the blender with the liquid from boiling, then strained it with a coffee filter. I then reduced the resulting liquid to about an ounce. It turned the royal icing a lovely deep magenta, pretty believable as red. 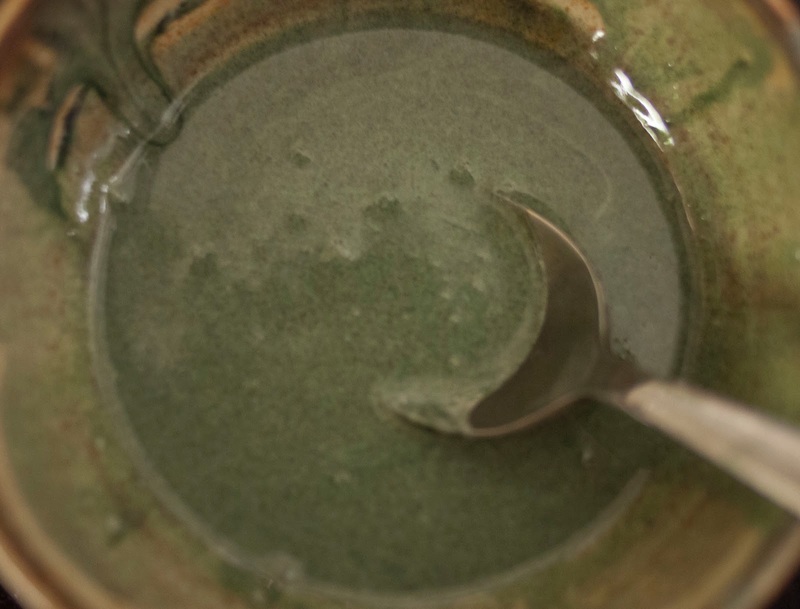 Green came from powdered spirulina, which was available from the bulk section of our natural grocery. I bought a tablespoon or so for about a dollar. I used only about a teaspoon to color this icing. Since the green seemed a little dark, I added some tumeric to brighten it. 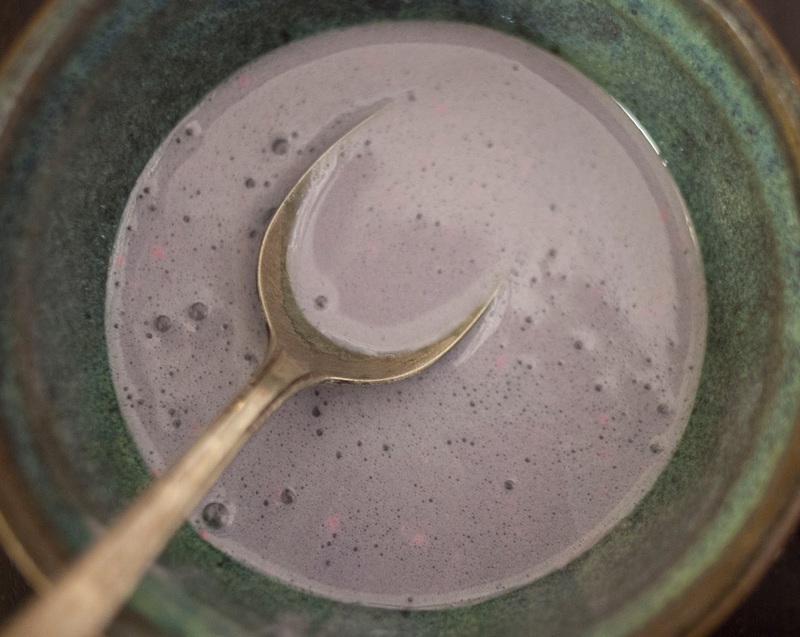 This lovely pale blue came from red cabbage, made basic by the addition of baking soda. I boiled half a cabbage, then removed the cabbage and reduce the liquid down to about 1/4 of a cup. I then split the juice into three jars for further experimentation. 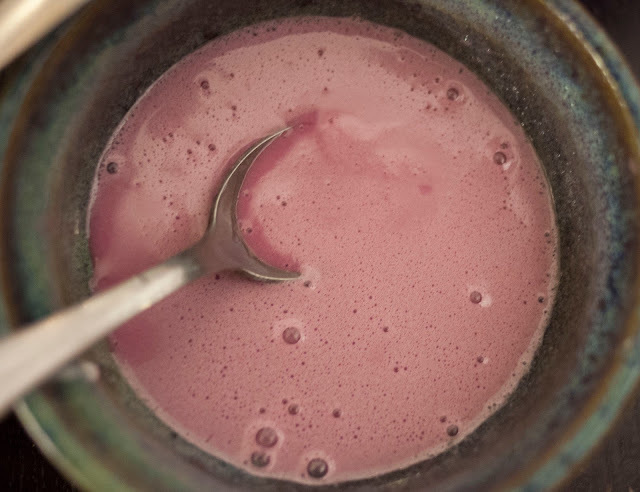 Red Cabbage juice, three ways: left, with baking soda. Center, unaltered. Right, with vitamin C (acidic). To get blue, I added baking soda just until I got the color to change. It was a pale baby blue in the icing. When it dried, it looked more aqua. The above purple is the beet juice with vitamin C added (acidic). The least impressive was the beets, which made a pale pink! 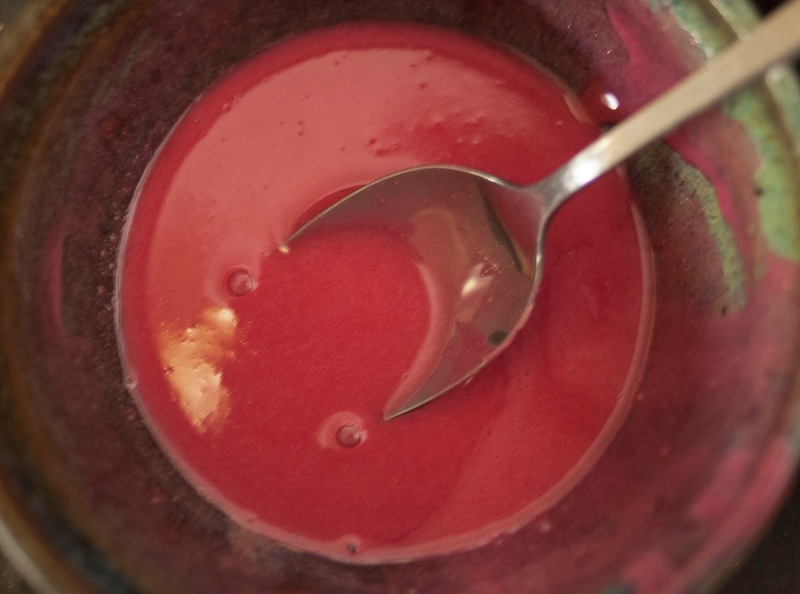 I boiled one beet in about 2 cups of water, then reduced the liquid down to 1 ounce. Perhaps I needed more beets? Little Bug, who loves pink, was delighted! Little Bug sampled all of the icings, and found them all yummy! We put all of the icings into squeeze bottles (from Michaels). Silly me, I only had 4... so we also had to use some cake decorating bags and tips. Little Bug really got into it this year! 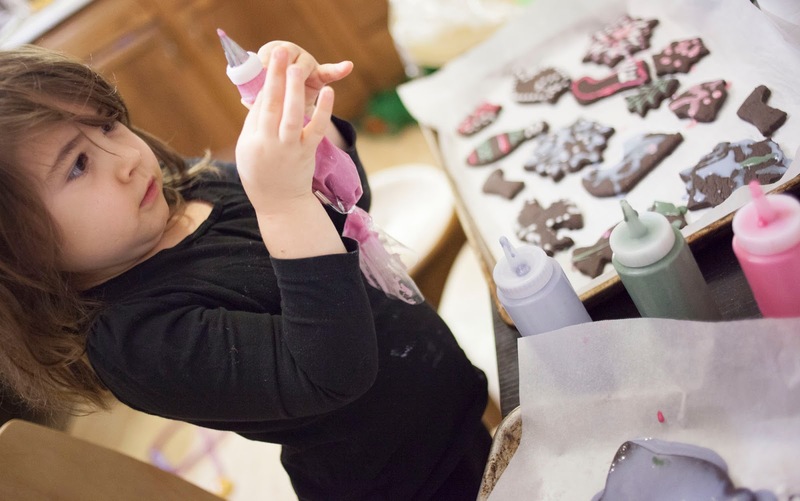 Oh, and the chocolate rolled cookie recipe that we used is this one... it is the best. Very easy to handle-- Little Bug rolled them out herself. And it is totally yummy. This is from LilaLoa... check out her website for more details. I noticed she also posted a link to a gluten free version of this recipe! As soon as the cold weather hits, all I want to make is cozy sweaters! I've sewn all sorts of wool knits- merino, felted wools, angora, etc, and I love the warmth, breathability, and texture of wool of all sorts. 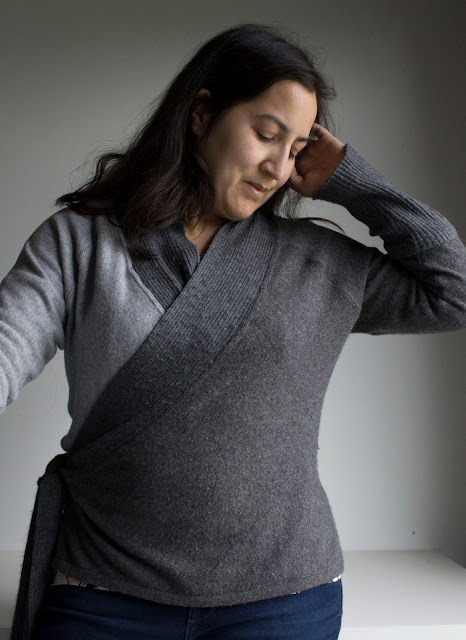 I am pretty sensitive, and I generally wear my wools with a long sleeve rayon or cotton top or shrug, or in rare cases I make a lined sweater. The one exception is cashmere, which I love wearing right next to my skin, and it is oh-so-cozy and warm. 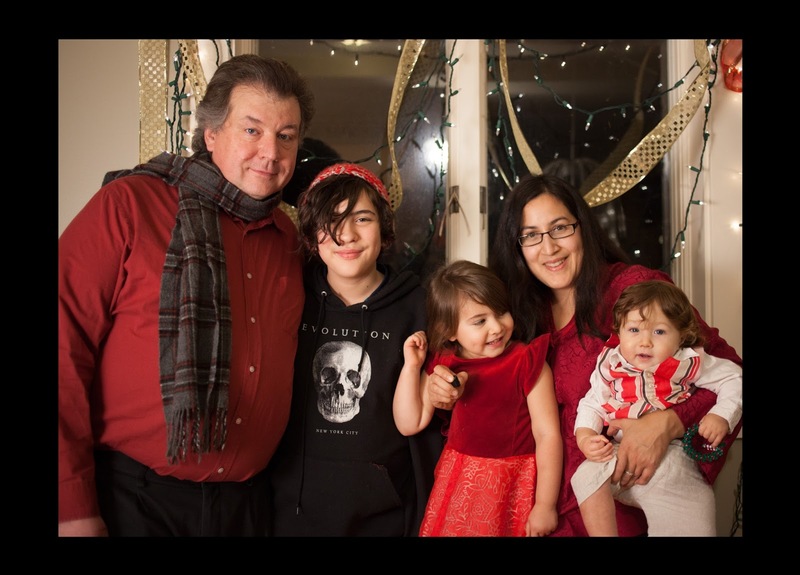 I once found a fabulous piece of cashmere knit (on MarcyTilton.com) that I made into a cozy wrap that I wear all the time. In fact, I'm wearing holes in it, and it is looking a bit ragged, but I wear it all the time anyway. I've been on the hunt for another piece of cashmere knit fabric, but it is oh-so-rare. Especially the really good stuff, in my favorite winter colors-- black and gray! Then, I was in the thrift store seeking items to refashion, and wandered into the sweater section just in case there was any cashmere to be found... and struck gold. Or cashmere. I found two sweaters in shades of gray, and I knew almost immediately that I wanted to make a Papercut Coppelia wrap with them. I've made a Coppelia once before, with a merino knit, and I wear it pretty frequently. It was one of the first indie patterns I every purchased... I have a real soft spot for wraps. 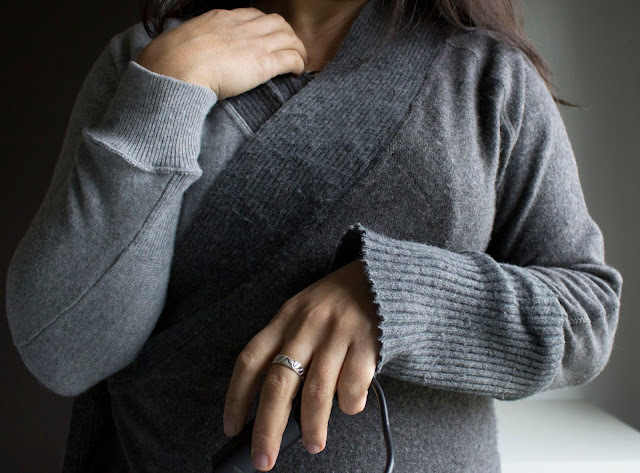 There is something about a cashmere knit that seems like it would be fabulous as a slim wrap. Previously I made a Medium, but this time I traced the Large. I thought it would give me a little more room with the bulkier knit, and quite honestly, I'm a bit larger than I was when I made my first Coppelia. But I sort of screwed up the back piece and cut the Medium with it. 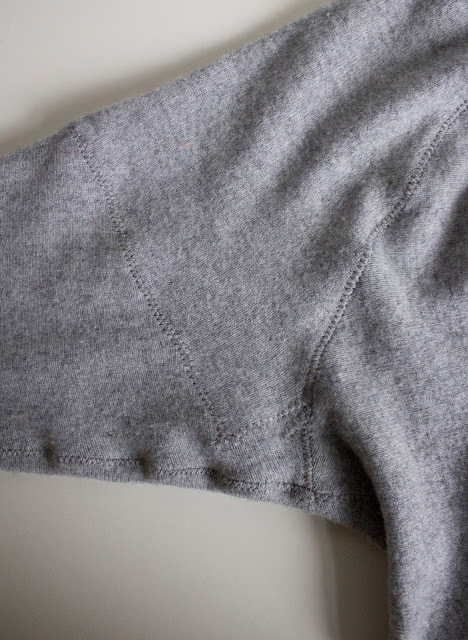 I tried to compensate by making the seam allowances narrower, and I think between that and the forgiving nature of the knit, the fit is pretty okay. I decided to make the wrap tie at the side, so one tie is longer than the other. I should have taken before pictures, but I'm not so good at that, I just jump right in. 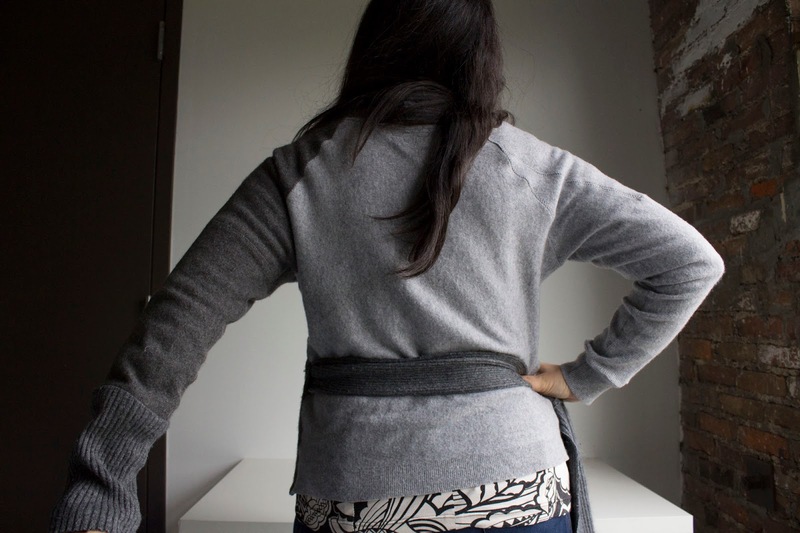 The lighter gray sweater was a women's XL, so I made the back and one of the front pieces with it, and managed to get a sleeve by pieces together the scraps. I managed to line up both the back and front pieces with the bottom edge of the sweater so that I could incorporate the ribbing, and for the sleeve, I sewed a saved piece of ribbing back onto the sleeve. 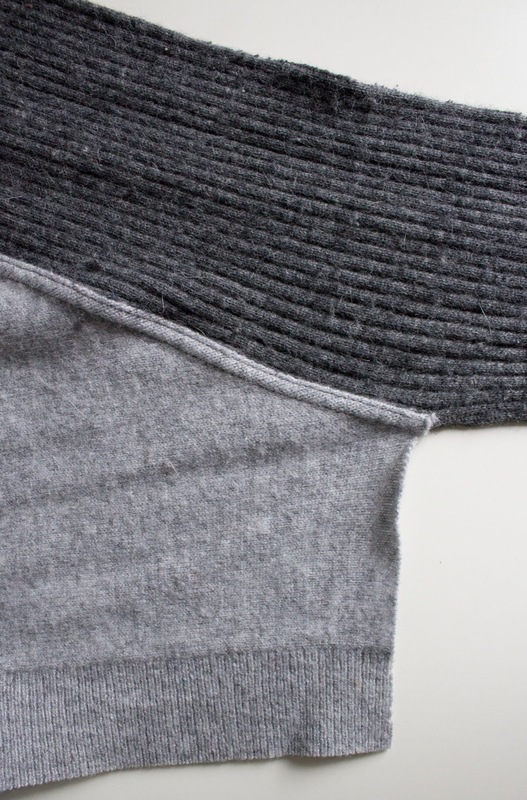 This is a closeup of the front bottom edge of the sweater. The ribbing on the bottom. I used the ribbing from the original sweater as the hem of my sweater, and left the right edge unfinished. The ribbing that makes up the neckline and continues to make the ties is topstitched with a double needle. In this pic you can see some of the crazy piecing I did to get the raglan sleeve. I used a zigzag stitch to join the pieces, than topstitched the seam allowances down with a zig zag. The darker gray sweater was a very small sweater, probably slightly shrunken in the wash also, so I barely managed to eek out the front piece and most of a sleeve. But I still managed to line up the front piece with the bottom of the sweater, so once again I used the finished edge of the original sweater. After cutting the main pieces of the pattern, I had a pile of tiny, tiny scraps, so I was back at the thrift store hunting for something to make the neck band and ties with. 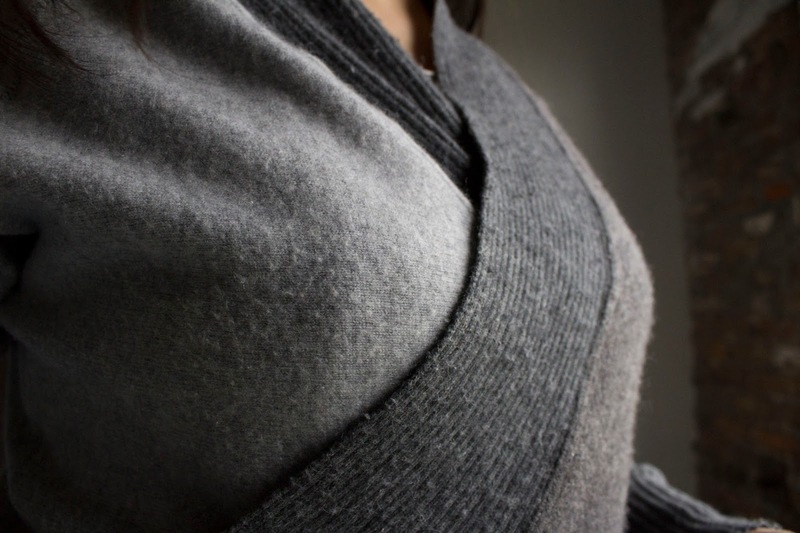 I found a gray angora blend sweater that had a thick band of ribbing at the waist. I had intended fold over the neckline as called for in the Papercut pattern, but after sewing on one edge, I liked the extra width. 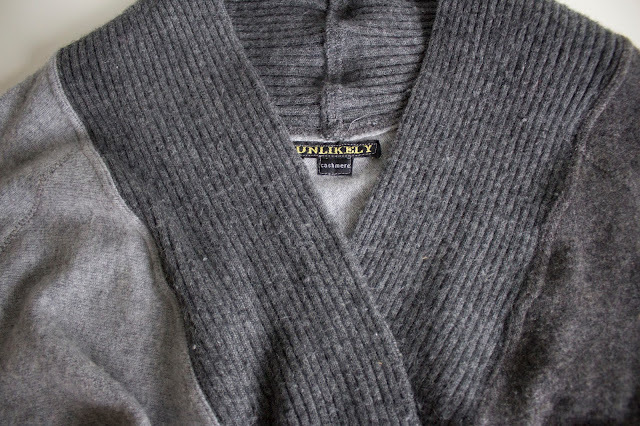 I borrowed a tag from one of the repurposed sweaters to designate the very special fiber content! Since the ribbing was finished on the unattached side, I decided to just leave it like that. I also used some ribbing from the angora sweater to finish the dark gray sleeve, making what looks like an oversized cuff from part of the sleeve. I can wear the wrap either way-- dark side out, or light side out. Either way, I tie it at the right side. Initially I made both straps long enough to tie in front, but I prefer it tied at the side, so I took the extension off of one of the straps, it was dragging on the floor. I love my new sweater, so very cozy! I almost had it done for my birthday, but refashioning definitely takes a bit longer than just working with yardage. So I'm going to just give myself an extension and call this my birthday sweater.